An investigation has been launched into an incident where eight people drowned after a cargo ship fled Russian border guards in the Far East. he New Star vessel was under the flag of Sierra Leone and had brought rice cargo to the port of Nakhodka. But it left without permission or notifying the authorities. The border guards following the ship and eventually opened fire. 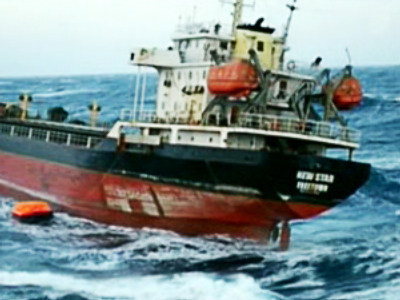 But on its way back the vessel was caught in a storm and sank – out of 16 crew, only 8 people were saved. The border guards say the ship ignored all warning signals while sailing towards the Chinese border at full speed. “The Russian border guards followed the New Star for over 15 hours. They used all kinds of warnings including sound, light and radio signals. They had also made a gun signal, which was ignored. So they had to open fire at the vessel – it had violated not only Russian but International Maritime code. I must say, however, that it was a cargo vessel, and we aimed at areas we knew for sure didn’t contain any people,” Igor Rogatkin, Deputy Head of FSB Border Guards Department, said.